In 2009, new gardener Misty Florez stepped up and volunteered to lead as Garden Coordinator. Under her guidance, we gardeners incorporated by-laws and rules, held monthly Steering Committee meetings, raised funds to expand the garden and have gone from a sleepy vacant lot of under 20 families to a dedicated volunteer community organization of over 45 families. Gardener Melissa Shook has documented our progress in photographs since 2010. Although there is oodles of material to add, since we are all volunteers, this website is not always uptodate. Check back here and also to our FaceBook page to time for new photos and news as we work to archive our history and progress. 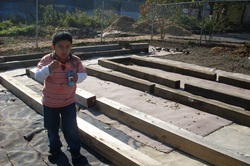 New raised beds constructed in 2009 and 2010 by YouthBuild/JustAStart volunteers make room for new families to garden. Our First Annual "Scarecrows in the Garden" exhibit and Open House and our 2nd Annual Harvest BBQ help us reach into our community. 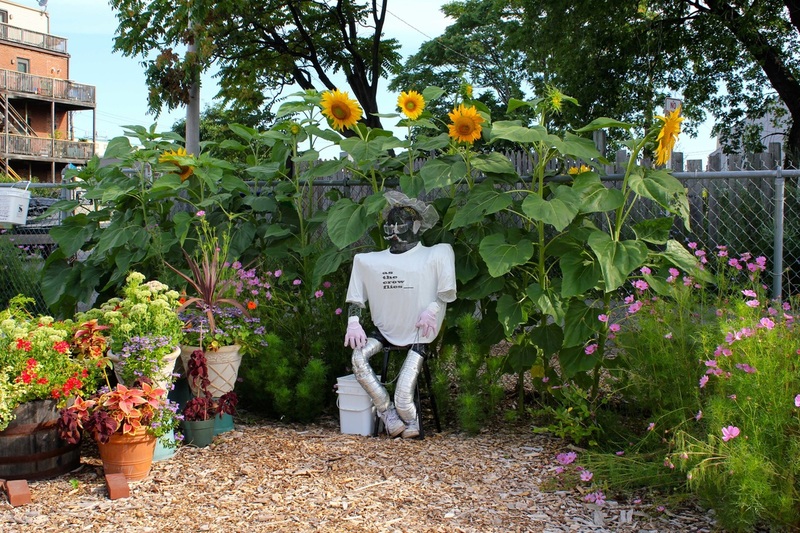 The Entrance Garden is show-off beautiful, thanks to gardener Maureen Cawley, donations from Northeast Nursery and "Fred" the scarecrow created by Chelsea High Artists.